I’m not a helicopter mom, but I am a protective mom. I freely admit I shelter my kids. Not from everything, but from a lot of things – especially foolish friends. It’s odd but sometimes we talk about sheltering or protecting our kids as if that is a bad thing. But as I think back to some of my friendships, relationships, neighborhood experiences, and influences growing up, it gives me perspective and understanding on how important protecting our kids really is. As our children grow older, the peer-to-peer influence can, and usually does, grow greater. There is great biblical wisdom in helping to give our kids a vision of godly friendship – not only to protect them from the wrong kind of friendships, but also to encourage them towards the kinds of friendships that can build them up. Our kids don’t come into the world with a picture of what Christ-like friendships should look like. But the Bible is full of examples of true friendship. We see in the scriptures above the beautiful picture of what deep friendship found in God really looks like. God used Jonathan to help David find strength during some of his most trying times. Ecclesiastes reminds us that we are stronger together than we are alone. We can work together, help one another up and defend one another. A study through some of these scriptures is a great way to give our kids a vision for choosing wise friends – friends that bring a blessing, instead of bringing suffering. We can’t protect our kids from every foolish friend, but we can prepare our kids to choose the right kind of friends. We can give our kids a vision of godly friendship. In an increasingly disconnected society, our kids need to understand the importance of and be encouraged to pursue healthy, loving, committed, sacrificial, and God-honoring friendships. Brave Girls Confidential– on sale now for 60% off – is a great resource for tweens that offers encouraging, Bible-based wisdom and Scripture, woven into stories of how faith and friendship can help us overcome the tough stuff in life. The Brave Girls bring each other through divorce, school and sibling struggles, and even difficulties between friends by pointing each other back to Christ and His Word. 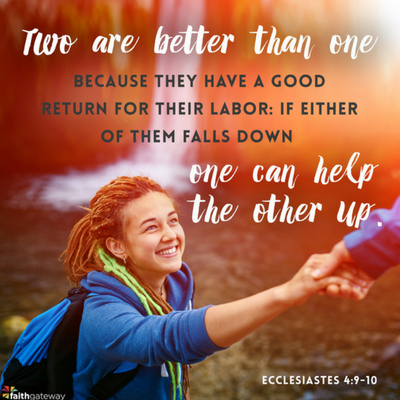 How have Godly friendships helped you in times of need? What steps can you take to build more Godly friendships…and help your children do the same? We’d love to hear your thoughts in the comments!